How the history of police brutality affects understandings of police behavior in minority communities. This fascinating book traces controversies about police violence back to the very origins of the New York Police. The author wisely treats the entire issue as a perennial set of political problems, thus reflecting the changing ethnic, social and political dynamics in the city. Although the use of violence has in some ways diminished, administrators have never ceased to minimize it, from the first day to the present.’ -Paul Chevigny, Professor of Law at NYU Law School, and author of Edge of the Knife: Police Violence in the Americas. 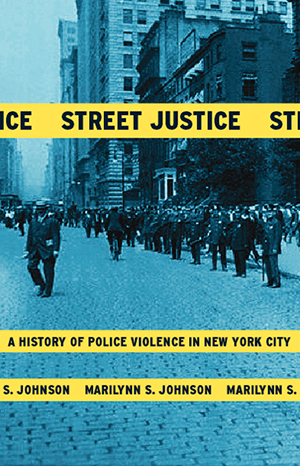 In this study of police brutality in New York City, Marilynn Johnson explores the changing patterns of police use of force over the past 160 years, including streat beatings, organized violence against protestors, and the notorious third degree. She argues that the idea of police brutality-what exactly it is, who its victims are, and why it occurs-is historically constructed. In the late nineteenth century police brutality was understood as an outgrowth of the moral and political corruption of Tammany Hall; in the heavy immigration years of the early twentieth century it was redefined as a racial/ethnic issue; and during Prohibition police violence was connected to police corruption related to the underground liquor trade and the’war on crime’ the federal government declared in response. Providing a history of police brutality up to the present day, Street Justice emphasizes the understandings brought to the subject by its victims, and reveals a long and disturbing history of police misconduct against minorities. But Johnson also argues that the culture of policing can be changed when enough political pressure is brought to bear on the problem.